Jimmy Iovine, Beats' co-founder who joined Apple after the company acquired Beats in May, today spoke at the University of Southern California's Global Conversation (via Business Insider) where he commented on the NFL's recent decision to ban players from wearing Beats headphones in order to promote Bose headphones. According to Iovine, the ban on Beats has been great for the brand. "I can't believe I'm this lucky," said Iovine, in reference to players who have begun wearing Beats headphones with tape over the logo to avoid fines. Iovine went on to say that Bose is "culturally inept." "What happened there, you have a tech company that's culturally inept," Iovine said. "There's no one at the company that said, 'If you ban these guys, you're going to look bad to the young people, and they're going to look like superheroes even though they're just pure capitalists -- well they're not pure capitalists, but they're real capitalists and [they] sold that company to Apple -- but you're going to make them look like the underdog." While Bose and the NFL signed a sponsorship agreement before the season began, the NFL decided earlier this month to ban players from wearing Beats headphones in front of television cameras to support its sponsor. Players are banned from wearing Beats headphones when conducting interviews during training camp, during practice sessions, and on game day, from before the event until 90 minutes after play has ended. San Francisco 49ers quarterback Colin Kaepernick, who has an endorsement deal with Beats, defied the NFL's ban and wore bright pink Beats headphones during a press conference, earning himself a $10,000 fine. 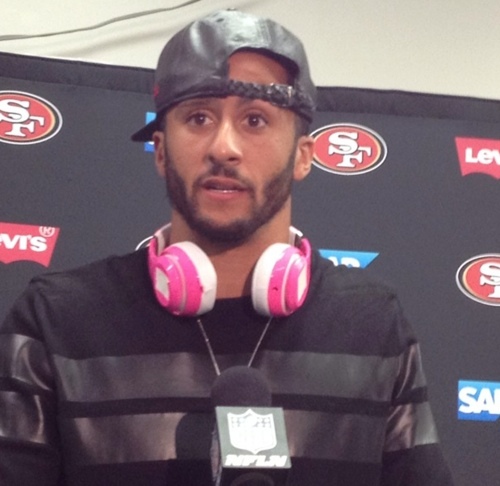 Since then, Kaepernick has been seen again wearing the same bright pink Beats headphones, but he has placed tape over the Beats logo to avoid further fines. In addition to being banned by the NFL, Beats headphones have also been banned from other major sporting events, including the World Cup and the 2012 London Olympics. Wearing headphones at a press conference makes you look like an idiot. They should put stickers with the word "Beets" over the headphones. He's probably rightthe ban makes Beats seem all cool and rebellious, rather than being just one more product of an enormous advertising budget. We have war, poverty and what not... Bose does not want Beats to be worn on NFL interviews. Beats does. So everybody starts crying. And making a huge deal out of it. People like that are worse than terrorists !!!! He gets paid to wear them. Pink signifies support for breast cancer awareness. Oh, wait, damn, I've been trolled. Been an audio engineer the past 20 years. Beats headphones sell because they have an awesome producers name on them. They are totally inferior to i.e Sennheiser which if course aren't looking so flashy... And thus boosting your self-esteem when walking the streets. You work for Apple now, Jimmy. Can't be running your mouth like that! Beats and sound technology in the same sentence? Beats sound honky and hollow. If someone confuse that with Bass, well yeah - they have bass. Kids buy Beats because they wanna stand out and because of small egos. They pay $300 for earmuffs to gain kudos and respect. And that they get by wearing beats. But the fame they gather is just as hollow as the sound of the muffs they wear to accumulate it.